Well, spring isn’t here yet (at least in the northeast) but the sun was out today, it was over 40 degrees (whoooo) and daylight savings time has begun. All in all as close to nice weather as it’s been around here for quite some time. Spring turns a young persons fancy to…….acoustic instruments (it also helps bring some of us out of hibernation). 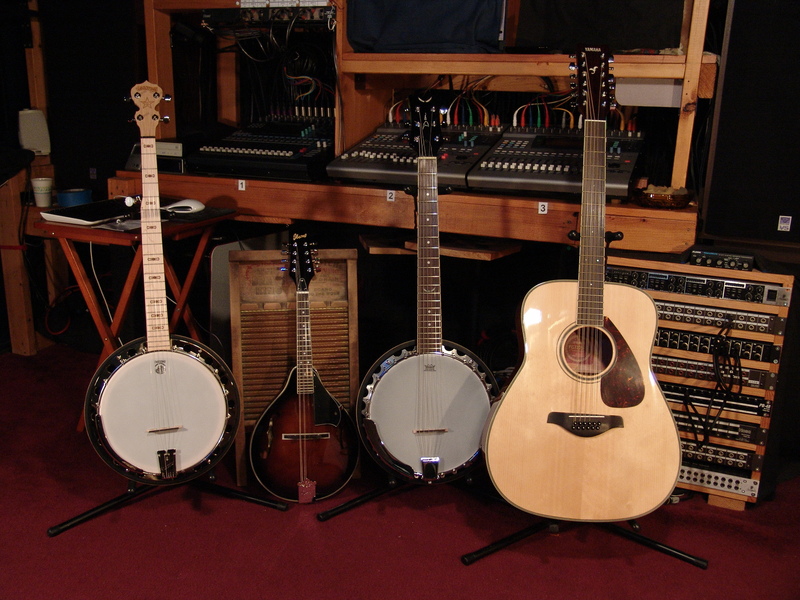 Over the winter months we’ve been collecting instruments for the studio to add some variety to our in house recording. Pictured below are some of the items we picked up. Not that we’ll use everything in a traditional manner. The options are limitless. As are the variety of ways you can mic, amplify or record acoustic instruments. Here’s a video with some ideas for recording banjo. You can count on us breaking the rules whenever possible (hhmmmm – phase shifter on mandolin?). So much to look forward to. To add to the acoustic flavor, here’s a video of Trampled By Turtles live on NPR. Can’t you just feel spring in the sound? Hope the weather heads to spring where ever you are.